When you need to conduct a deposition outside of your local state, how do you schedule a court reporter? Maybe you’ve scheduled many out-of-town depositions in your career, but maybe you haven’t. Whether you’re an attorney, paralegal, or legal assistant, let’s discuss some of the options you have. You may have plenty of advanced notice and time to schedule the deposition. However, sometimes it’ll be crunch time. You have a day before a deposition begins, and the expert witness has another case to testify for that afternoon. You have no time to waste, and no other option but to use an out-of-state reporter. If you have previously scheduled court reporters outside of your local region, you may already have a good working relationship with a reporter or reporting firm who can cover the deposition. Who does your network know? If you don’t know of someone in that region, you may turn to your network and ask them. There may be someone at your firm who can refer you to a good reporter or firm they’ve worked with. Or, you may ask around to those in your network outside of your firm. If you’re like most people, you’ll probably do a Google or Bing search for “court reporters” in the city you’re going to and will get some possible solutions. If you don’t have time to look up who you’ve worked with or to wait on your network to give you a recommendation, you’ll likely start with an online search. The search engines will do their best to give you what they think you are wanting. However, how do you know who and what you are getting based on your online search results? Of course, you can read online reviews and speak with the court reporting firm you find before scheduling. But, if you’ve never worked with a reporter or reporting firm, there’s always a possibility you won’t be getting the type of service you prefer. If you already have a good working relationship with your local court reporting firm, you may want to ask if they would be able to cover out-of-town depositions. If you’re already pleased with their level of service, it might make it easier on you to rely on them. They may already cover that region with their reporters and you might just not have known about it. If they don’t cover the region with their own reporters, they are likely to have more experience to know what reporting firms and reporters would be good to cover your job. For example, here at Brooks Court Reporting, we have worked very hard over the years to develop relationships with other court reporting firms around the United States and even Internationally. Because we have been in the business for decades, we know who would be a good fit for your needs. Why risk the chance of getting a reporter who may not provide service at the level you expect when you can let your local reporting firm handle it? Your local court reporting firm can be a “one-stop shop” for you. In other words, instead of having to work with many different court reporting firms and reporters across the nation, you might be able to just work with one. This may make it easier for you to do your job and make this process more efficient for you. 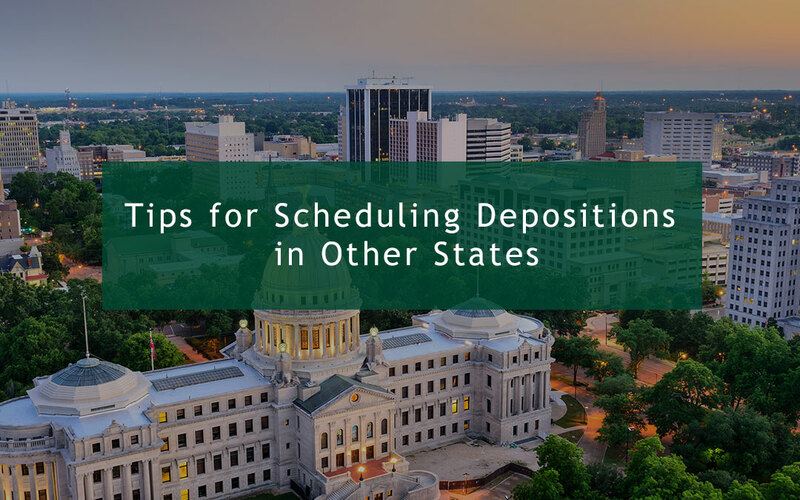 If you schedule your depositions and reporting services through one firm, you only have to call, email, or fill out an online scheduling form with one firm. The transcripts and associated files would be in the format you’re used to, all from one firm. The billing would be done with one firm. The communication would be with one firm, with the people you’re already comfortable working with. If you would prefer to do the work necessary to develop a large network of reporters and firms throughout the nation to ensure you have quality reporters to cover your depositions, that’s completely up to you. You may already have this type of a network built. If not, consider your local court reporting firm. In another related article, we discuss 3 Tactical Advantages of Video Depositions for Attorneys. If you would like to speak with us further about handling out-of-town scheduling or have any questions about this topic, give us a call at (601) 362-1995 or using our online scheduling form. Brooks Court Reporting covers all of Mississippi and much of the surrounding states with our own reporters and regularly schedules and manages out-of-state depositions (including high stakes litigation cases) for our clients.